HagiaSophiais a great architectural beauty situated in the heart of Istanbul and an important monument for both Byzantine and for Ottoman Empires. 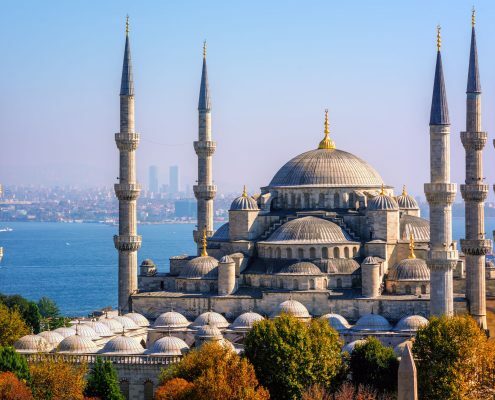 It was originally built as an Eastern Orthodox cathedral and later converted into a mosque when the city was conquered by Sultan Mehmed II in 1453 CE. It remained as a mosque until 1931 when it was turned into a museum. Eyup Sultan Mosque/Tomb of Hazrat Abu Ayyub Ansari ( ) is located on the outskirts of Istanbul.When the Prophet (peace and blessings of Allah be on him) emigrated to Madinah, all of the Ansar were keen to host the Prophet (peace and blessings of Allah be on him) in their house. The Prophet (peace and blessings of Allah be on him) made the decision that he would stay where his camel stopped and it subsequently stopped at the residence of Abu Ayyub Ansari. The Prophet (peace and blessings of Allah be on him) stayed at his house for 7 months.